Every year, without fail, there is a certain door in our house that becomes stuck. It's only one door, and it's not irrevocably jammed, only enough to make its presence known. And not for all that long, only a week or two tops, when the combination of heat and humidity comes together in such a way that either the floor heaves or the door swells - we're not exactly sure which. That particular circumstance occurred in the middle of September this time around, when we had cool mornings but summery afternoons. That week the socks we put on with a shiver before breakfast were discarded with a huff by noon. Said door got stuck halfway between open and closed, leaving you with the option to either give it a solid hip-check into obedience or turn your body such that you can scoot your way through. Being resistant when it comes to confrontation, I choose the latter approach - meaning that for the last few days I have found myself ambling sideways through the front hall with embarssing regularity. This morning the door swung open freely, in a swift unencumbered arc. October was a month we'd face head on. Howdy to you. And you too, Autumn. We had our first dalliance with comely autumn and all of its trappings a few days earlier; last Saturday we went slightly mad with autumnal cliché. There were orchards with the first leaves scattered between rows, and apple picking and cider too. And then an Apple Almond Cake followed soon after. But it was only yesterday that I faced the season squarely. I made soup. 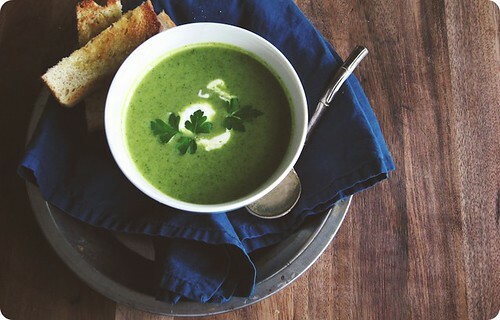 And since the colour will soon be scarce around here I made a soup that was patently green. Our big, enameled cast iron pot took its place on the stove, squat and welcoming. Zucchini and onions into a bath of olive oil and butter, shallots and garlic arriving at the last minute. The rest is pretty much a call of everybody into the pool, when broccoli joins the party and bubbles away until tender. A leafy tumble of spinach wilts into the soft vegetables, and then its all buzzed until smooth. With austerity most certainly against my nature, a spiky dollop of crème fraîche blended with horseradish was the final flourish. And if you were to say, smear some of that crème fraîche upon some golden toast soldiers for dipping, I would not bat a lash. In fact, I might just think that you're exactly my kind of person. With some inspiration from Molly. The cream is a variation on this mayonnaise, and it is its sinus-clearing intensity that acts as a foil for the sweet subtlety of the soup. The broccoli should be cut into smallish chunks so that the vegetables only take the briefest amount of time to cook, thereby preserving as much of their colour as possible. In a large, heavy-bottomed pot melt the butter into the olive oil over medium heat. Add the zucchini and onion and cook, stirring often, until the vegetables are tender but without colour, around 10 minutes. Add the shallots and garlic and cook for 1 minute more. Stir the broccoli through the other vegetables. Pour in around 4 to 4 1/2 cups of stock, just enough to submerge the vegetables. Tuck in the Parmesan rind. Raise the heat to bring to the boil then reduce to maintain a simmer, leaving partially covered to cook for 10 minutes or until the broccoli is tender. Meanwhile, stir together the ingredients for the horseradish crème fraîche in a medium bowl. Set aside. Remove the Parmesan rind. Stir in the spinach and once it's wilted, purée the soup with an immersion blender, adding some of the reserved stock if necessary to achieve your preferred consistency. Check for seasoning and serve with crème fraîche alongside. • Although I have not included specifics, I try to layer flavours here, seasoning with salt and pepper throughout the cooking process (while sautéeing the vegetables, upon adding the stock, and then to finish). It is hard to pinpoint exact amounts, but taste often and season as you go. A light touch is best; you can always add more at the end.